The olive tree, Olea europaea L., is in the title genus of the Oleaceae family. 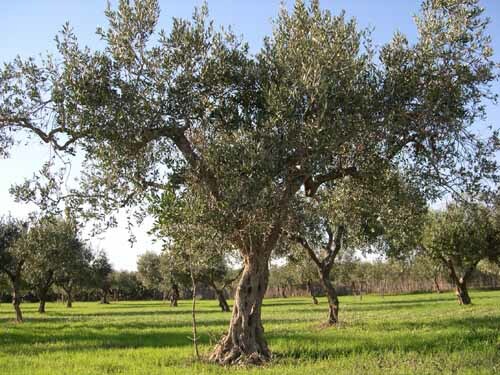 Each Mediterranean country has its own unique cultivars, and many seedling olive trees are cultivated. Different cultivars are generally used for oil (e.g., ‘Picual’, ‘Leccino’, ‘Frantoio’) and table olives (‘Manzanillo’, ‘Sevillano’, ‘Ascolano’, ‘Calamata’). In California, ‘Manzanillo’ and ‘Sevillano’ constitute about 90% of olive production. 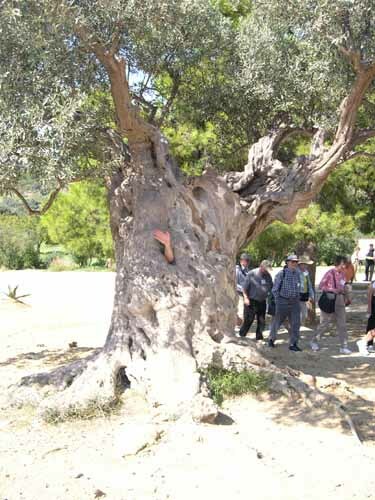 The olive tree originated in the eastern Mediterranean area, and has been cultivated by man since ancient times. Trees are extremely long-lived (up to 1000 yr) and tolerant of drought, salinity and almost total neglect, and so have been reliable producers of food and oil for thousands of years. Earliest references of olive oil use and international trade date to 2000-3000 BC. 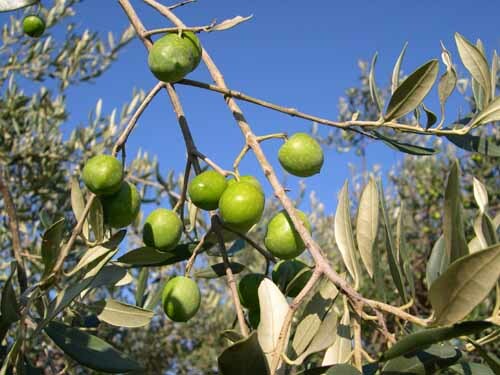 The olive was spread throughout Mediterranean Europe and North Africa very early, due to its ease of vegetative propagation and cultivation in dry climates. The Romans built on earlier work on olive culture by Greeks, Arabs, and Egyptians, and refined olive oil extraction and improved cultivars used for oil. Today, the industry remains largely confined to Mediterranean countries of Europe, the middle east, and north Africa, where it began thousands of years ago. The California industry began in the late 1800s as settlers planted orchards from cuttings taken from the original trees planted at Spanish missions. By 1900, there were about ½ million trees being grown in California, largely for olive oil production, but shortly thereafter, pickling and canning procedures were developed for producing black olives, the primary olive product from California today. World (FAO 2004) – 15,340,488 MT or 34 billion pounds. Olives are produced in 39 countries worldwide on an area of over 20 million acres. Average yields are 1680 lbs/acre. United States (USDA 2004) – 94,500 MT or 208 million pounds, produced on 32,000 acres, all in California. The industry value was $60.7 million in 2004, and prices were about 29 ¢/lb. Average yields are 5700 lbs/acre. 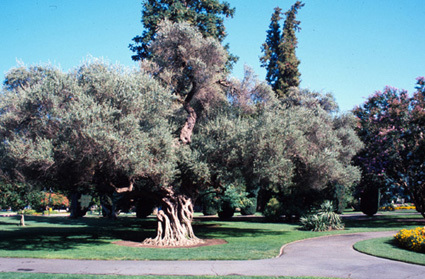 Olive trees are large, evergreen shrubs in their native state, but are trained as stout trees on massive trunks, especially in older plantings. Most trees have round, spreading crowns, but tall, cylindrical trees are grown in some parts of Europe. Leaves are small (1.5″ long, 1/4-1/2″ wide), linear, with entire margins and acute tips, silver-green in color, and fairly thick. Leaf arrangement is opposite. Leaves live about 2 years. This olive tree photographed on the Capitol grounds in Sacramento, California, is not as old as those in Europe, but still makes an excellent ornamental specimen. Small, off-white flowers are borne in racemose panicles of 15-30 flowers in axils of 1-yr-old wood. Most flowers are staminate by pistil abortion, leaving only 1-2 perfect flowers per inflorescence, which may set fruit. The ovary is superior, and there are 4 sepals and petals, and 2 stamens. Flowering occurs rather late relative to other tree crops – May in California. Most olives are self-fruitful, but some cultivars bear heavier crops when cross-pollinated. Wind is the pollinator. The fruit type is a drupe. Fruit are oblong with smooth, waxy surfaces. Color is green when immature, turning yellow-green in autumn, with red, purple, or black coloration at full maturity. Olives require 6-8 months for full maturation. Olive fruit are drupes, green when immature and turning purple or black when fully mature. Photo courtesy of Dr. Riccardo Lo Bianco, University of Palermo, Italy. Soil – wide variety of soils, tolerant of high pH, salinity, excess boron, and drought, but will die in a few weeks if flooded. Climate – Mediterranean climates; olives cannot tolerate high humidity due to disease and physiological disorders. Chilling requirement varies among cultivars; those grown in California have relatively high requirements (1000 hr). Cold hardiness may approach 5-15°F in midwinter when fully acclimated. Worldwide, rooting of cuttings is the most popular method of olive propagation. Due to the ease of rooting, most olives are grown on their own roots, from cuttings, suckers, or ovuli. There are no particular rootstocks of worldwide importance. 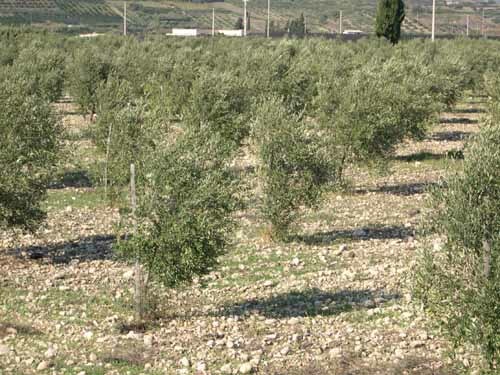 Traditional olive groves are usually comprised of large olive trees, scattered at irregular distances from each other, as a result of tree mortality or grafting/rooting in-situ to fill in empty spots. There may be as few as 10-40 trees/acre. More intensive orchards are typically planted at densities of 40-60 trees/acre. Olives naturally form large shrubs, with spreading canopies similar to citrus trees. Young trees may be headed to promote initial branching, and shoots below 2.5 to 3′ removed to allow shaker attachment for mechanical harvest. Afterwards, undesirable limbs are thinned and suckers removed from the trunk, and trees branch naturally on their own. Pruning cuts are designed to open the canopies to light, increasing the depth of canopy involved in fruiting and discouraging black scale infestation since these insects congregate in shaded areas. Time of pruning is critical; the bacterium causing olive knot disease is spread by rain and can only enter trees through wounds. A mature, open center olive tree in Sicily. Olive trees in newer orchards are often planted at much higher density. 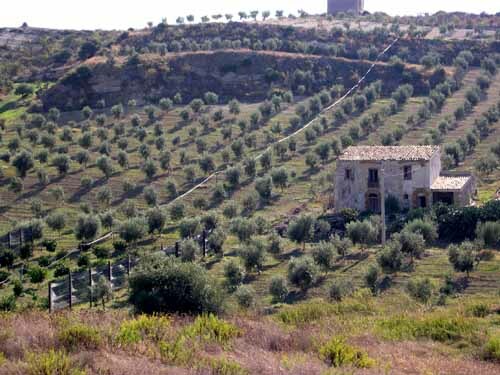 Older, traditional olive orchards often consist of widely spaced olive trees. Most table olives are harvested when they change from green to yellowish-green in color and are firm; this is usually mid-autumn. Oil olives are harvested in late autumn or winter when they have turned black and reach their maximum oil content (20-30%). Olives are traditionally hand harvested, a process that is not only tedious and laborious, but represents the major proportion of the costs of production. Hand harvest is accomplished by three techniques: 1) collection of fallen fruit from the ground, 2) “milking”, or the stripping of fruit with half open hands from limbs which falls into picking bags or onto nets below the tree, 3) beating limbs with large sticks to dislodge fruit, which is also collected on nets. Mechanical harvest of olives has been used to a limited extent in more intensive orchards. Table olives are cleaned and transported to processing plants, where growers are paid based on fruit size, color, and total weight. The fruit are washed and may be stored temporarily before processing. Raw olives are bitter due to the glucoside oleuropein in fruit, which is neutralized by soaking in 1-2% lye (sodium hydroxide) followed by thorough leaching with water to remove the lye. Oil olives are brought to mills where they are crushed whole, usually by two large, round stones rotating in opposite directions. Cold pressing is the most popular method of oil extraction. Table olives are often stored in brine or acetic/lactic acid solutions for several weeks or months. Green olives can be stored in refrigeration for 4-8 weeks, depending on temperature, before they experience chilling injury. Temperatures of 40-50°F are used. Once processed, table olives can be stored for about 2 years, similar to other pickled products. Olive oil can be stored many months, particularly if kept from light and heat. Worldwide, most olives are made into olive oil, with smaller amounts canned in a number of different styles. California production is somewhat anomalous in that the vast majority is a single product, the black-ripe canned olive. Olive oil marketing is controlled by an international agreement, overseen by the International Olive Oil Council located in Madrid. Flavor and acidity are the primary determinants of oil quality. Official definitions of olive oil are based upon flavor, acidity, and processing methods used. Virgin oil. This is minimally processed oil extracted by cold pressing. It has three subcategories: extra, fine, and ordinary, based largely on acidity and flavor. Refined oil. This is virgin olive oil refined to remove off flavors and odors by lye or other treatments, which do not alter the glyceridic structure of the oil. Blended oil. This is virgin oil blended with refined oil with acidity <1%. Olive-pomace oil or residue oil. Oil recovered from pressed olive paste by solvents falls into this category. Per capita consumption of olive oil varies widely by country. In Greece, over 17 liters (4.5 gallons) are consumed per person, the highest per capita rate in the world. Italians and Spaniards consume about 10 liters (2.5 gallons), but most other countries consume less than ½ a liter (1 pint) per year. Canned olive consumption is far lower, 1.3 lbs/person in 2003.